Manufacturers Index - C. H. Bidwell Thresher Co.
C. H. Bidwell Thresher Co.
Charles H. Bidwell was born in the town of Albion, Orleans county, N. Y., on the 10th of September, 1848. His father, Cyrus Bidwell, a native of Troy, N. Y. is living in Albion, aged eighty years. His mother was a native of Vermont, and died in 1872. She was well known as an earnest Christian worker and a woman of exceptional strong mind and good judgment in matters of business. Her sister, Harriet Hawley, or better known as " Aunt Harriet," lived in the family and had much to do in looking after the boy Charles. Through the mother and aunt's influence the boy was sent to the higher schools (rather against the will of the father who desired to make a farmer of him), to Albion Academy, where he graduated, then to the Brockport Normal School for two years, when he was called home on account of his father and mother having poor health. Mr. Bidwell's liking for mechanical inventions and manufacturing commenced to develop early; at the age of ten years he made a small bean thresher and drove it by belting to the grind stone. His grandfather was a natural mechanic, a wagon maker by trade, the father also possessing the same qualities. Mr. Bidwell was one of the first to introduce steam threshing in Orleans county, and followed this successfully for some ten years. During this time he was working on and perfecting his patent bean thresher, in 1881 he began its manufacture in a very small way and it proved to be the only practical bean thresher made. 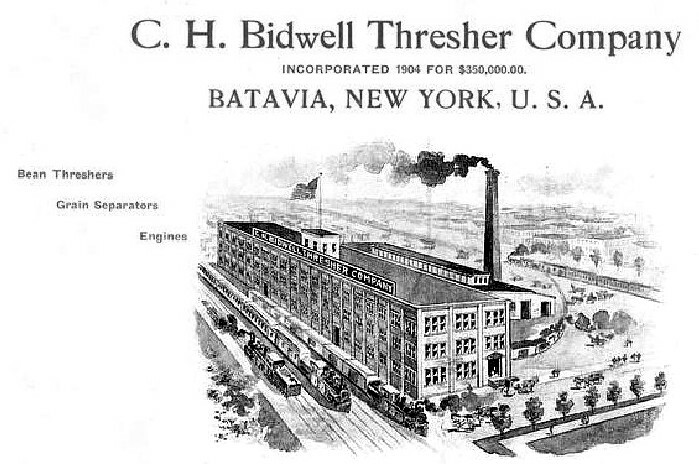 Mr. Bidwell continued its manufacture in Albion until 1888, when he removed to Medina, N. Y., and in 1891 organized a company, called The Bidwell Bean Thresher Company, with a capital stock of $20,000. 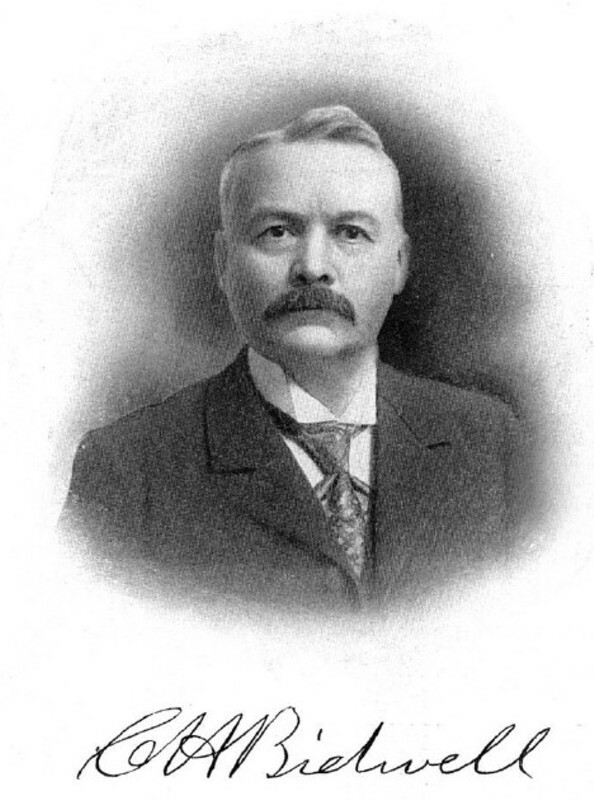 In 1893 he purchased the balance of the stock and is now sole proprietor. The Bidwell bean thresher is too well and favorably known in all bean growing sections to require explanation, having practically no competition on merits. Mr. Bidwell's name is well and favorably known in connection with profitable growing of beans throughout the entire country, and the value and thorough workmanship and excellency of material used in his machines is everywhere recognized. Mr. Bidwell has this season perfected a bean harvester, on which he has patents; this too has proven to be a success on the start. The entire period first described was one of obstacles, predictions of failure, and other discouragements, which seem to be waiting all inventors and men who attempt to introduce a device that will do a certain thing better and easier than it was ever before done. But he is not of the stuff to falter in the face of discouragement. His principle characteristics are invincible determination, perseverance, and almost obstinacy in overcoming obstacles and opposition, which serves to bring into activity those characteristics, and have been strong factors in his success. Mr. Bidwell was married in 1873 to Luella E. Albin, of Vermont; they have four children, one son and three daughters. Mr. Bidwell is a Prohibitionist and believes that the day of triumph for that cause will sometime arrive. Arrangements have just been completed whereby the business of C. H. Bidwell, manufacturer of threshers, will hereafter be carried on under the name of the C. H. Bidwell Thresher Company. The capital stock of the new concern is $250,000, Mr. Bidwell retains $165,000 of this amount. The directors named in the certificate of incorporation are Charles H. Bidwell, Hawley N. Bidwell, George Wiard, Mrs. Adelaide R. Kenney, and Dorr C. Mylecraine. A limited amount of stock is open for investment. The Bidwell Thresher Works has shown remarkable success, in its advancement from its beginning 21 years ago, when Mr. Bidwell, the inventor, made his first bean machine at Albion, N. Y., doing all the work by hand. Prior to this he worked for the Westinghouse Company ten years, and ran a steam-threshing outfit. It was this practical experience that enabled him to perfect the Bidwell bean thresher, that is so well known in all bean raising sections, as the only practical bean thresher on the market. For the first four years arrangements were made with the Curtis Company, at Albion, to manufacture these machines, Mr. Bidwell then acting as superintendent, pattern maker and salesman. In 1888 he moved to Medina, started manufacturing on his own resources, and continued there for 12 years. In 1900 he moved to Batavia to secure better shipping accommodations, and erected the substantial brick factory, which he now occupies. His business has already outgrown this factory, for it has increased more than two-fold since he moved to Batavia. Since coming to Batavia Mr. Bidwell has perfected a new grain separator which is considered one of the best in the field, and is especially adapted to the trade east of the Mississippi River. Thus far one hundred and ten of the grain separators-have been sold and eighty more will be placed on the market this year. Mr. Bidwell will continue at the head of the industry which he has so successfully conducted up to the present time-Batavia Times.